Hi, I’m Bill Hibbler and welcome to my social media tip of the week. This week, I’m going to share some tips and tricks you can use on LinkedIn. I have to admit, although I do use LinkedIn, I don’t use it as much as I should plus I really need to update my profiles to reflect the changes in my business. So, I searched high and low for some good tips and I thought, hey, as long as I’m at it, why not share them with you? It just takes a few minutes in your LinkedIn settings to create a link based on your name rather than a bunch of random characters. And you can use it in things like your email signature. There’s a school of thought that recommends using a keyword with your name. Something like “RebeccaRealtor”. That’s not a bad idea if you have have an occupation that can be described in one word like attorney, realtor, chef or jeweler. It’s less useful for say, a human resource expert or a marketing consultant. Personally, I prefer to use my name to make it easier for people already familiar with me to find me. That’s especially important if you have a fairly common name. In my case, when you search Google for “Linkedin Bill Hibbler”, I come up #1. By the way, if you’d like to connect with me on Linked In, just click on the LinkedIn logo at the top of the column on the right side of this page. In other words, don’t blast 100 people at once on LinkedIn. It’s the wrong approach entirely. Think quality over quantity. In fact, the shotgun approach can get you in trouble. LinkedIn will warn you once and then they’ll shut you down. When you make a new connection in person, via email or via social media, let people know you’re going to connect via LinkedIn. That way, when they see your invite, they’re likely to accept. 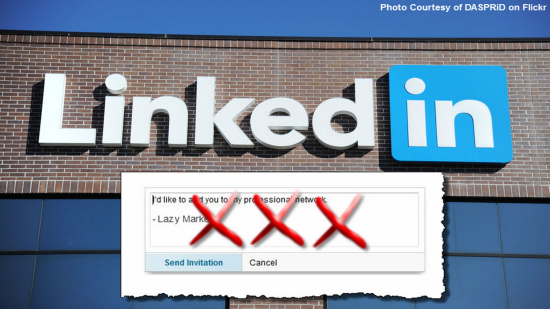 Don’t be lazy and just hit the blue ‘Connect’ button on LinkedIn which sends the generic “I’d Like to Connect on LinkedIn” message. Don’t do it! …especially if it isn’t someone you know well. Instead, take a moment to personalize the message. If you met briefly or are connected by association, this is where you let them know that. And teach this to your employees, too. Google uses backlinks to drive search engine results. Every LinkedIn account has a place for 3 Free Website or Blog links, and LinkedIn leaves these links open to indexing by Google. Ask that your employees list your company website, company blog and company facebook page. Tip #5: The magic of 3! Before your sales reps make a call to a prospect, have them spend 3 minutes and find 3 things on LinkedIn to talk about. It’s much much more compelling than talking about Real Housewives of Kentucky or the weather. They should be professional head shots and should present you in a positive light looking straight at the camera. Do not use photos with your spouse, your best friend, your kids or your pets. And don’t use the default image. Bring in a pro photographer to take shots of your entire team. You’ll be able to use these for LinkedIn, your website, Twitter and Press Releases, too. By the way, these tips come your way via Wyn Nathan Davis from The Sales Experts in London. If you want a LOT more http://www.thesalesexperts.com/101-linkedin-tips/” target=”_blank”>tips on Linked In, check out Mr Davis’ article here. I was looking up my last name to see who would come up, and yours did my father told me that our last name is uncommon and nine times out ten we are probably related. I just thought i would share that.